RICARDO ARENYS GALDÓN (1914 – 1977). Born in Barcelona, he practiced a skilled painting style with excellent control over means of expression. 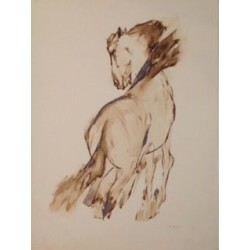 Around 1949 he started to specialise in the theme of horses. He participated in the Primavera Exhibition in 1934 and in the Nacional Barcelonesa in 1944. He won the third place medal at the National Exhibition in Madrid in 1945, and the second place medal at the National Exhibition of Fine Arts in Madrid in 1955. He held exhibitions at the Sala Gaspar in 1946, 1966 and 1977. His work has also been shown in Paris, Lisbon, London, Bilbao, and other major cities. ARENYS Ricardo There are 3 products. 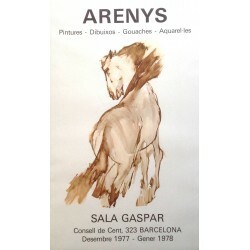 Historical original poster Artist: Ricard Arenys Title: "Pintures - Dibuixos - Gouaches - Aquarel·les" Year: December 1977- January 1978 Size: 90 x 55,5 cm. Printing method: offset Attention! The colour that you see at you screen may vary from the original poster. Tiny foxing spots may be present. Graphic work Artist: Ricard Arenys Title: S.T. 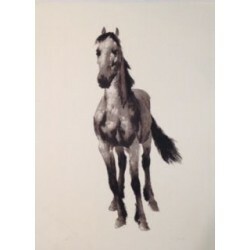 Year: - Size: 76 x 56 cm. Media: Color lihography Attention! The colour that you see at you screen may vary from the original poster. Graphic work Artist: Ricard Arenys Title: S.T. Year: - Size: 76 x 56 cm. Media: Color lihography Attention! The colour that you see at you screen may vary from the original poster. Tiny foxing spots may be present.